I'm delighted to be kicking off Stenhouse's blog tour for the second edition of the wildly popular Daily Five book by Gail Boushey and Joan Moser! This promises to be an exciting week, filled with great reflections and great questions. Gail and Joan's Daily Five structure has helped to completely transform my teaching and my classroom over the past five years. Last April, I was told I was moving from first grade up to fourth grade in a new school. After getting over the initial shock of it, I started planning for my new adventure. The first thing I knew for sure was that the Daily Five would remain an integral part of the daily routine. This speaks volumes to the impact I know the Daily Five has on the learners in my classroom! Even if you aren't currently using The Daily Five in your classroom, so many of the strategies can be applied! Joan and Gail pride themselves on keeping up with current brain research, best practices, and connecting with both students and teachers. They've built the Daily Five on the foundation of a workshop structure and continue to improve upon it as their learning grows. Choice is a key feature of the Daily 5 structure, and it is mentioned throughout the book. I am a huge fan of choice in my own learning, and I believe it also holds true for our students. Joan and Gail remind us that choice increases engagement, fosters self-directed learning, helps students demonstrate responsibility, and gives students ownership of their education. The Daily 5 Structure is flexible in nature. Students have choices, and so do teachers. While the Sisters give the guidelines for what they do in their classrooms, they share multiple perspectives and show that this structure can be tweaked to fit the needs of the students we teach. 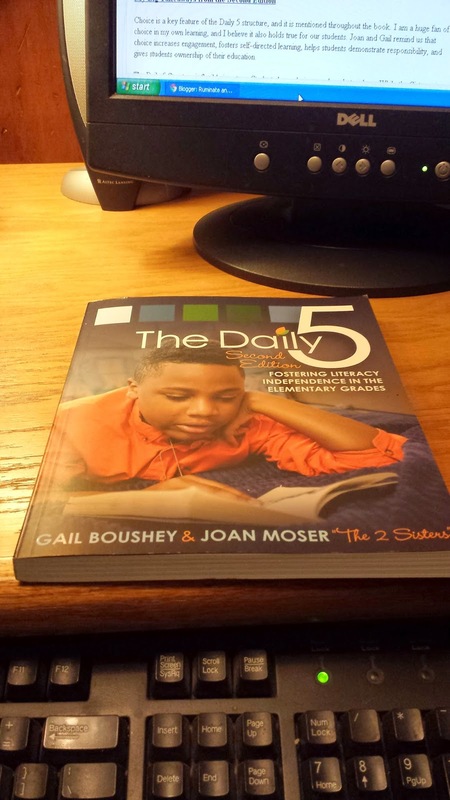 Gail and Joan also share how the Daily 5 has evolved since they wrote the first edition of the book, including the new order in which they introduce each component, how many rounds are done daily, the importance of Foundation Lessons, and more. After the short bursts of instruction we give, Joan and Gail encourage us to trust our students and our teaching. So much of what they shared regarding stamina-building and brain compatible learning is incorporated into the Daily Five independent work time, as well as through the opportunities for movement between rounds. It all comes together after using the 10 Steps to Teaching and Learning Independence, designed by Gail and Joan. This strategy works so well in so many situations and can be revisited throughout the year as needed!! I'm sure I'm not alone when I express my excitement over the Math Daily 3 chapter! I devoured their latest thinking about independent math practice. Looking ahead to next year, I can already see what my foundation lessons will need to be so that I can get Math Daily 3 up and running! I'll definitely be spending time over the summer revisiting this chapter in particular so I can be ready to go in the fall. One of my favorite tips from the book was the reminder to have students share what their partner talked about during Turn & Talk time. I love how this fosters good listening skills and collaborative learning! With the adoption of CCSS, many teachers are feeling the pressure to teach more and have kids independently practice less. How does the Daily Five structure support students as they learn the Common Core standards? We also want to keep in mind the brain research, in particular that of John Medina and Ken Wesson. Our lessons need to be brief, the number of minutes our children are in age up to 10 minutes for older students. If we teach too long or too much, we are wasting our breath and their time, as the instruction will not stick. CCSS is steeped in reading. We cannot talk at children and expect them to learn to read closely, they need to practice themselves. And thinking about text complexity, each grade level from 2nd grade up has CCSS.ELA-Literacy.RL __.10 (http://www.corestandards.org/ELA-Literacy/) stating that by the end of the year students must read and comprehend at the current grade and with scaffolding as needed at the high end of the range. The only way to progress into more complex texts or to achieve this goal is to spend time engaged in reading. Talking to kids about reading is much like talking to kids about how to make a free throw in basketball or describing how to play an arietta on the piano – not very effective. However, just in time coaching or teaching, specific to the individual needs of students, along with substantial practice, that’s how readers progress and grow. Technology has become more and more prevalent in many of our classrooms since the first edition of the book. Can you say more about how (or if) you’ve found ways to seamlessly integrate technology into the Daily Five? Technology can be integrated into The Daily 5 in a number of ways. The caveat here is that it all depends on the technology available in each individual classroom. 1) Read to Self: Personally, I love reading on my Kindle. I choose to read this way over a paper book whenever I can. Kindles, tablets and even computers are a fabulous way for some students to Read to Self. In addition, given the wonderful resource of the Overdrive app, http://omc.overdrive.com anyone can read books on these devises for free by checking books out through this app from their public library. All that is needed is a library card. 2) Read to Someone: Recording students as they read, then playing it back or even sending it as an attachment to a family member is one way of using technology to support Read to Someone. 3) Work on Writing: For some students, writing with a pen and paper can be frustrating. Crafting a story can be hard enough and then layer on the laborious process of forming letters and words and the result can be a frustrated writer. Having students write using a keyboard or tablet is a great option. There are also some products on the market, such as Dragon Dictation, that are available in a scaled down version for free. 5) Listen to Reading is also a simple way to integrate technology into the classroom. There are a myriad of programs and apps that read to children and allow them to interact with books. Here is a link that will take you to a list of sites and apps. Accountability is a concern for some teachers I know. How do we know kids are practicing the skills and strategies we’re teaching in our small bursts of instruction? Because of the Daily 5 Structure, we are allowed the time to conduct more individual conferences than ever before in our career. Each time we meet with a student, we are looking to see if our instruction and their practice is sticking. Are they using the strategy yet? Are they using it with automaticity? Do they need more support? If they aren’t grasping the strategy is this the best strategy for them right now or perhaps I need to change the strategy? These are the questions that are always running through our minds with each conference. Since our goal is to confer with between 9-12 individuals every day and even more if we do not pull small groups, we have time to revisit our work with the children often and change and adapt our teaching to best meet their needs. This is a very high level of accountability for students verses handing out a worksheet and giving a grade. Here are two resources that support accountability. Our struggling math students are often missing the fundamentals and need more time than your average or advanced students. Do you differentiate Math Daily 3 the same way as you differentiate Daily 5 (with goals for individuals?) Can you share about what you're working on with small groups or with individuals during that time? Once we had developed The Daily 5, it became our favorite time of the day. The ability to work with individuals and small groups while the rest of the class was engaged was heaven! That said, when it came to Math, it was still a struggle. For us, we were still teaching with the whole group ‘spray and pray’ method of teaching. You know, spray them with instruction and pray they get it. And... there is a special giveaway for each of the stops on the blog tour! Leave a comment to be eligible to win a free, signed copy of the new edition of The Daily 5! One winner will be chosen from each blog stop. Thanks again to Zsofi from Stenhouse and Gail & Joan for including me on this blog tour!